My skincare routine is pretty direct: every day in the shower, I’ll rinse my face with a gentle face wash and then post-shower I’ll spritz a little bit of diluted tea tree oil to keep my face fresh throughout the day. So far, this routine hasn’t failed me, so I had some reservations about trying a new toner. 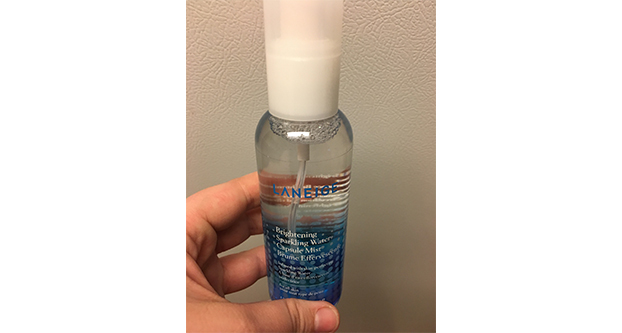 At first glance, the face mist is a tiny bit intimidating: it comes with the bottle as pictured, but it also comes with tablets that you mix in with the initial toner to create a sparkling mist, as described by the product’s name. I was most intimidated by the mist because I wasn’t sure just how gentle it would be, seeing as I didn’t need anything super drying or abrasive for my combination skin. Application is seemingly easy, but can get a little tricky. The spray nozzle is a pretty traditional mist, but I find that I typically am using more product than I should be because the spray radius is so narrow. If the sprayer was a tiny bit wider and covered more face area, I would definitely be more apt to use this product. This brightening toner runs for almost 25 bucks per 5 ounce bottle, but after a few days use, I would say that I’m comfortable spending that money for clean-feeling and visibly brighter skin. With complete honesty, I can say that this product has lived up to its name: after three days of use, my skin is noticeably brighter. This is particularly convenient with the current trend in cosmetics: a dewy, bright, and youthful complexion. Anyone who is itching for a bright complexion without greasy shine should definitely check out this product. It’s availability at Target, Sephora, and Amazon makes it incredibly accessible and gives consumers to check it out without the long wait that traditional shipping requires. All in all, I’d say it’s a gentle product that agrees with even the most confusing combination skin. I’m not entirely sure at this point that I will rebuy the product, but as of right now, it’s definitely in my good graces and more importantly, my beauty tool-belt.